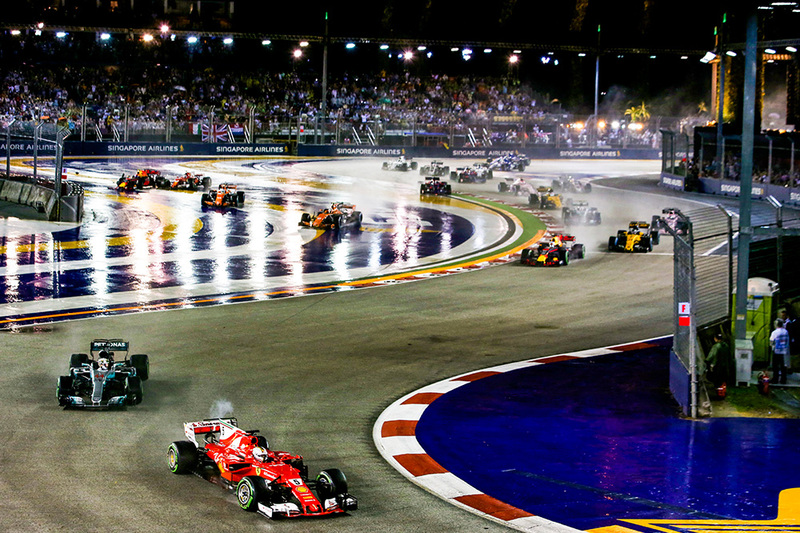 ‘The short straights, the slow, tight corners and the bumpy surface all make the Marina Bay Street Circuit one of the trickiest tracks of the season for us,’ says Wolff, whose team arrives at Marina Bay with a 25-point cushion over Ferrari. ‘On paper, the track should favour the Ferraris, but the Championship fight is so close that predictions are almost meaningless. Red Bull’s Daniel Ricciardo is hoping his special relationship with Singapore might just put him up there with Mercedes and Ferrari again, and after being stunned in 2011 by the physical intensity of the race he has come to terms with its demands. Nico Hülkenberg of Renault couldn’t agree more. ‘It’s a unique Grand Prix in more ways than one,’ says the German, who will make it doubly special when he competes in his 150th F1 race at Marina Bay on Sunday. Even drivers who haven’t raced here look forward to their baptism by floodlight. Take Pierre Gasly, the Toro Rosso driver who will graduate to the full Red Bull Racing squad in 2019. ‘Marina Bay is one of my favourite tracks to drive on the videogames, so I’m looking forward to experiencing the real thing,’ says the French youngster who expects Singapore’s night music to be right up his street. Fellow French-speaker Charles Leclerc, who comes from the city that hosts the world’s other great F1 street race, Monaco, is on the same wavelength. ‘It will be a special experience to drive there in real life,’ says the 20-year-old Sauber driver whose move to Ferrari for 2019 was announced on Tuesday. Wise words all round, but perhaps it’s best to finish with something from a man of few words. That’s Grosjean’s Haas teammate Kevin Magnussen, on course for his best points haul in a season so far.